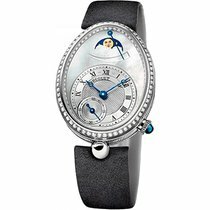 Reine de Naples wristwatch in 18-carat white gold. 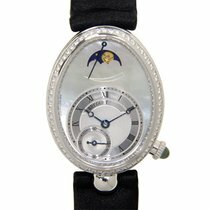 Bezel and dial flange set with 128 diamonds weighing approx. 0.77 ct. Self-winding movement with running seconds. Power-reserve and moon-phase indicators. Silvered gold dial, hand-engraved on a rose engine and partly in white natural mother-of-pearl. Sapphire caseback. Water-resistant to 3 bar ( 30 m ). Dimensions : 36.50 x 28.45 mm.